If you are like many people, when you think of flickering lights, you imagine scary movies and Halloween. However, there are some people (maybe even you) that encounter this issue much more often. If you are or have been living with flickering lights, you likely understand they are more than just a simple inconvenience. Electricity is what keeps your home safe and comfortable. When issues arise, this puts your home, family, and well-being in jeopardy. In addition to be annoying, if you have flickering lights, it may also be the sign of a much larger issue. In fact, according to statistics, electrical fires in homes account for over $1.3 billion in property damage and almost 500 deaths annually. If you are tired of the flickering lights in your home, learn about some of the most common reasons they occur. Also, make sure to contact the pros for any significant issues. They will ensure repairs are made safely. Generally speaking, flickering lights are the result of a reduction or a fluctuation in total household voltage that results in the lights dimming for a moment. Several issues can cause light flickering. Understanding some of the most common issues will help you know what to do to solve the problem. 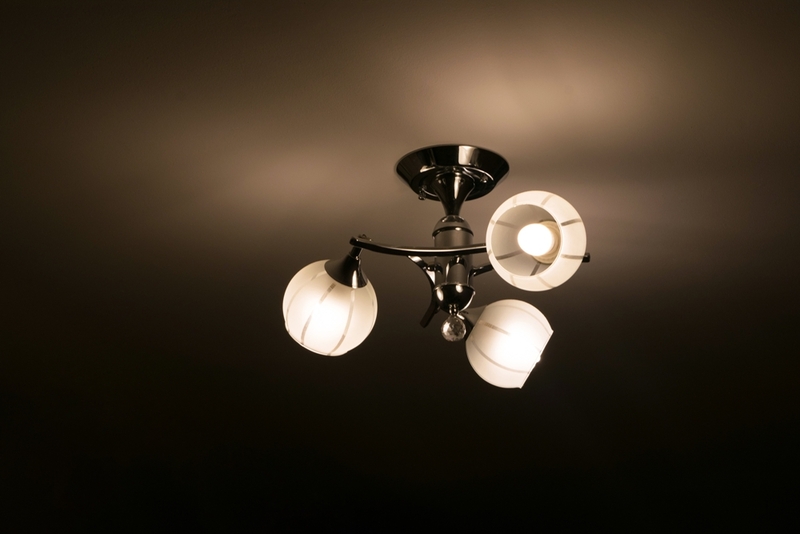 Some of the most common causes of flickering lights can be found here. The larger appliances in your home may pull 100 (or more) amps from your wiring when they are cycling on. This sudden, significant surge in power can result in your lights flickering and dimming momentarily. To ensure there isn't a more serious issue, you may want to call your electrician to inspect the wiring. There could be a problem with how your appliances were wired to begin with. If they are overworking the circuit, then this issue is only going to get worse. Is there a bad connection on a light or lamp, or in a fixture's on/off switch? If so, this may cause flickering. You can see if the issue is the connections by wiggling the on/off switch. If the light starts to dim as you are wiggling it, chances are the issue is a bad switch. Keep in mind, while it may be easy to replace a switch located in the lamp cord, ones integrated into a socket are more challenging. It's best to leave this to the pros. An unseated bulb will rattle in its socket. This can result in inconsistent connections, as well as regular flickering. To fix this, just tighten or change the bulb. This will reestablish a solid connection and help eliminate any possible dips in your electric current. One of the most common sources of flickering for LED bulbs is the use of dimmer switches. The majority of dimmers are made to handle higher electrical loads. This means that the low-voltage LEDs may dim or flicker if they are connected to higher-power dimmer switches. You also need to check the compatibility of your bulb with your dimmer prior to making a purchase. Or, you can opt to replace your dimmer switch with one designed to work with LED bulbs. Did you know that fluorescent lights are more likely to flicker than LED and other types of bulbs? Warm-up cycles, the age of the bulb and the temperature are all common causes of flickering in fluorescent lights. While minor flickering is no reason to be worried, if you notice constant dimming or flickering, then you should replace the fluorescent bulb to fix the issue. If this doesn't work, then it's best to call a professional electrician for help. In some situations, appliances in your home can have bearing failures. This results in the motor having to work harder when it starts up. When this happens, the appliance will draw more current and result in a noticeable light flicker. Also, lights may flicker if a load is activated suddenly or unexpectedly. One example of this is your sump pump. It may result in a noticeable flicker or dimming even if it has been circuited properly. Another issue could be your neighbor's lights. It's extremely likely that you share a transformer with several of your neighbors. Because you are sharing the same circuit, the loads are going to impact your own electrical supply. With benign flickering issues, there's no real cause for concern. However, there are other problems that are more serious and dictate you take action right away. For example, if you notice much more flickering than normal with no significant changes in the electrical system, it may be an early indication of more serious problems. One example of this is if a connection has become loose and it creates a higher resistance point. This is extremely dangerous and could eventually lead to a fire. If you are having issues with flickering lights, it's a good idea to contact the pros if you can't figure out what the issue is. They can diagnose the problem and ensure the underlying issue is fixed in a timely and efficient manner. If you need help with flickering lights or any other electrical issue, reach out to our team. We offer both residential and commercial services and provide many resources on our regularly updated blog to help with electrical issues you may have. Don't ignore an electrical problem. It is only going to get worse and more dangerous as time passes.